everything i need to know about life i learned by killing smart people and eating their brains. I've been spending a lot of time over at Tumblr, so there's that. Some of my art's up at DeviantArt if you're interested in checking that out. I'm also on Facebook, probably more than I should be. I do the twitter thing, as well. Livejournal is where I used to spend a lot of my time. I also have a Dreamwidth account, but it's pretty much a dupe of the LJ. And here's my Flickr page, if you're interested. The traditional personal info section. Dreadful, isn't it? 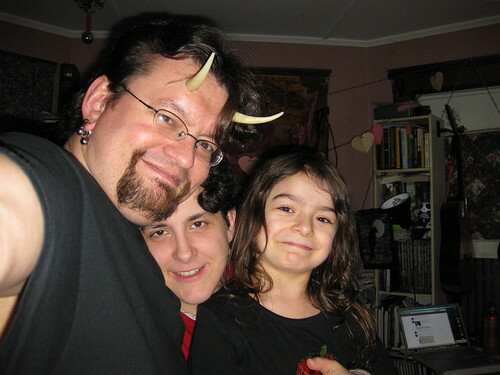 And here's the family me, my wife, and our beloved psycho daughter. the crow clan © 2009 Joe Crow. All rights reserved. © 2009 Joe Crow. All rights reserved. Initial design by NodeThirtyThree.